Late on the morning of Sept. 11, 2001, I walked northeast in Manhattan from Wall Street, my sandals gritty with ash. I had just spent 45 minutes trapped on a northbound subway train that had slammed to a halt, below and two blocks east of the World Trade Center, as a sudden change in pressure made our ears pop. We had waited between stations as pulverized concrete gradually choked the air of the subway car, and then another hour, after we escaped, for the blizzard of debris to settle. As I stepped out of the bank lobby where we’d taken refuge, I held my first cellphone, a bar with a hard antenna, out in front of me with my parents’ Massachusetts phone number plugged in, and pressed the button fruitlessly: send, send, send, send. I knew the towers had been on fire: I had come up out of the subway earlier that morning to find the towers burning, watched for a few minutes, then decided to get out of there the fastest way I could. But here are some things I did not know until I had walked two and a half miles away from the scene and calls began coming through: That passenger jets had been hijacked. (Someone had mentioned a plane, but I assumed it was a little private one, off course.) Whether my parents knew I was alive, and how to reach them or anyone else I knew, with the cell network swamped and endless lines at every pay phone. Strangest of all, as black columns of smoke behind me obscured the still unfamiliar skyline—I had just moved to New York—I had no idea what had caused that change of atmospheric pressure underground. I did not understand that the towers were gone. When disaster overtakes a city, as happened in New York that day, it can be as incomprehensible to those at the center of events as it is to those waiting anxiously for news from the scene. But as news of Boston’s Marathon bombings spilled out to the world this past Monday, people near and far were instantly deluged with information, thousands of images, and messages from loved ones. The technological speed, effectiveness, and scale of the response—both here and worldwide—was something that, as I wandered bewildered that day in Manhattan, I could not possibly have imagined. photographers. But who carried a camera everywhere? My primitive cellphone was built to do one thing, make calls, and when that function failed, I was as out of touch—and unable to report my experience from the scene—as I would have been in 1900. Think of the contrast with this past Monday. In 2013, Google instantly responded to the bombings by setting up a Person Finder site. “Someone has received information that this person is alive,” say thousands of status reports. The Boston Athletic Association’s online tracker became a way to find where on the course a runner had last been detected. Investigators collected cellphone photos and videos at Logan Airport from those leaving Boston; self-appointed detectives on Internet bulletin boards scoured thousands of crowd images for clues. On Facebook and Twitter, as Bostonians and visitors wrote to say that they were safe, their phones and computers lit up with “likes” and relieved responses from friends around the world. Within 12 hours, I had fielded e-mails and texts from friends checking on me from Kinshasa and Tel Aviv, Istanbul and San Francisco, and could reassure them promptly, even with the cellphone network overloaded. By the night of the bombings, the network of neighborly care, assisted by technology, seemed to extend in toward the city from every direction. 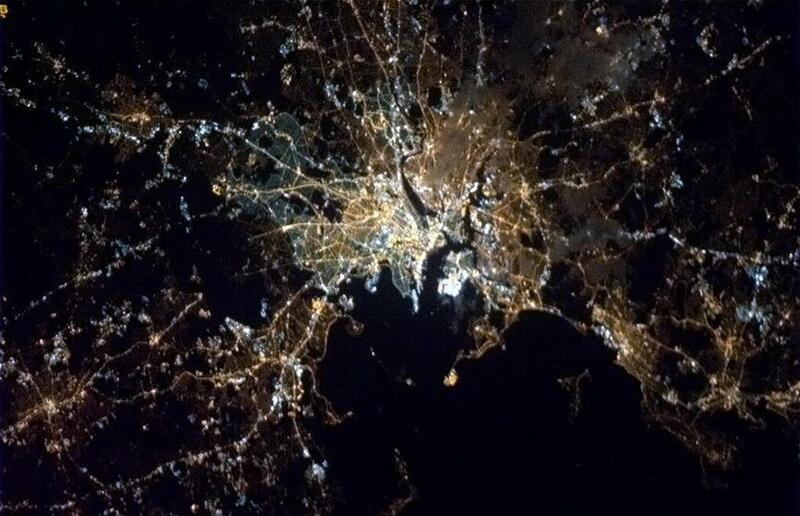 A Canadian astronaut, Chris Hadfield, even tweeted a tender photo of a glowing Boston from space. Like so many others, I have qualms about the way our digital devices leave us always reachable, distracted, stripped of privacy. GPS and surveillance cameras track our movements; dinner can be interrupted by e-mail from work; we lie in bed, tweeting trivialities on our phones, instead of reading a book. Supercharged by technology, the furious search for the perpetrators meant false alarms in the press and on websites such as Reddit, where some of the possible suspects circled publicly in red are just innocent spectators like anyone else. Meanwhile, some of the most tragic uncertainties of Monday remained beyond technology’s reach: Why would anyone do this? How will the injured and the bereaved, and the big-hearted civic spirit of the Marathon itself, survive their terrible wounds? Yet our ubiquitous pocket phone-camera-computers, our powerful web of connections to old friends everywhere in the world, meant that the first questions we ask in such times of disaster—are the people we love safe, and how can we help—were now answerable in minutes, not days. What’s the value of millions of people not spending hours in stomach-turning suspense, but being able to find loved ones and reach out to strangers immediately? It’s hard to quantify. But when I think back to the blank, solitary morning I spent on Sept. 11, I can only give thanks for the astonishing, vital network we have built in the 12 years since. Amanda Katz is the deputy editor of Ideas. E-mail her at AmKatz@globe.com or follow her on Twitter @katzish.